The New York Red Bulls have signed outside back Ethan Kutler to an MLS contract, the club announced today. 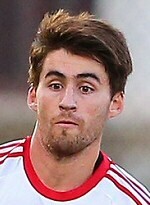 Kutler becomes the seventh player from New York Red Bulls II to ink a first team contract. "Part of the value of our USL team is having players already in our environment that are ready to step up in these scenarios," said Red Bulls Sporting Director Denis Hamlett. "We know Ethan well, and he knows our system and our players. This is an exciting day for Ethan, his family and our club, and we are pleased to welcome him to the MLS roster. We know he will continue to work every day to make himself and our team better." Kutler, New York's second-round pick (39th overall) in the 2017 MLS SuperDraft out of Colgate University, signed with NYRB II ahead of the 2017 season. He has made 25 appearances for the Red Bulls' USL affiliate, logging 2,141 minutes, scoring one goal and contributing two assists. Kutler ranked fourth on the team in interceptions last year with 43 and leads the team in that category with 22 in 2018. His lone professional goal came in a 2017 USL Cup Quarterfinals win over the Charleston Battery. He is the seventh player to first sign with NYRB II before being promoted to the first team, joining Tyler Adams, Aaron Long, Vincent Bezecourt, Florian Valot, Stefano Bonomo, and Dan Metzger. "Ethan is another player that we think has progressed well during his time in USL, and he has earned this opportunity," said Head Coach Jesse Marsch. "He understands our style of play and what we ask from our outside backs. We know he will continue to work hard and will be ready if called upon." "I am beyond excited to get the nod and continue doing what I love for this organization," Kutler said. "Years of hard work, sacrifice, and commitment have led to this moment. Nothing stops here and I will continue to push myself to make an impact at the MLS level." "I have lots to learn, however I know that my teammates and coaches will continue to support me through the process. Thanks to my teammates and coaches at NYRB II for developing me into the player I am today."